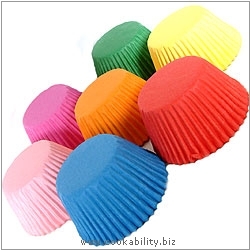 Easybake rainbow greaseproof bun cases. Bright colours, red, pink, fuchsia, blue, orange, green and yellow to fit most UK trays. Supplied in a polypropylene container for easy storage. Dimensions: 51mm base x 38mm high. Colours may vary but correct last time we checked.